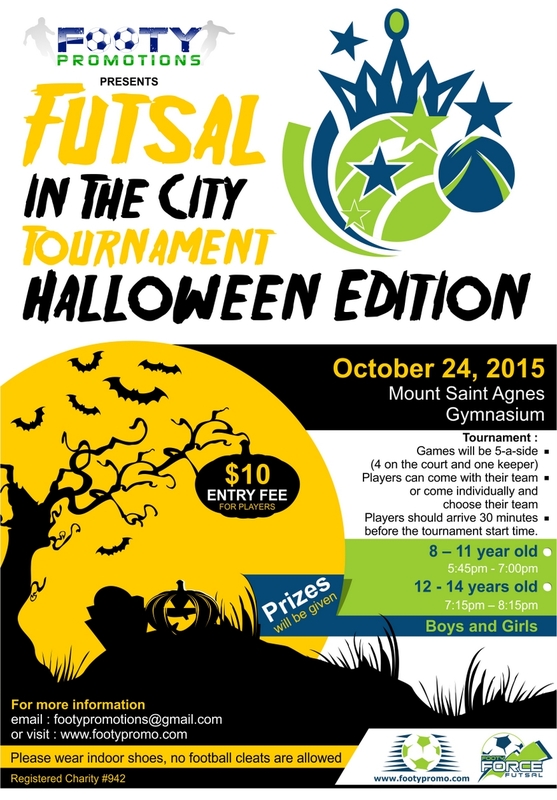 Footy Promotions will be hosting the “Futsal in the City” Halloween youth tournament on Saturday October 24th, 2015 at the Mount Saint Agnes Gymnasium. The tournament will start at 5:45pm for players between 8 – 11 years old. Then, immediately following, players 12 – 14 years old will start at 7:15pm. Both boys and girls are welcome to participate. A spokesperson said, “We are excited to continue the Futsal in the City tournament series with a Halloween Edition. The last tournament saw 12 teams participate over 3 age groups. JFK Young boys, FF Thirteen and FF United were crowned champions in their respective age groups. We anticipate another great atmosphere with thrilling futsal games.